…The club that is ‘Kathryn Ireland Ojai Home Fan Club’! Thanks to this wonderful blog, I got introduced to Kathryn’s home, and have been drooling ever since! Ok, that’s not a very pretty picture and doesn’t befit this post. 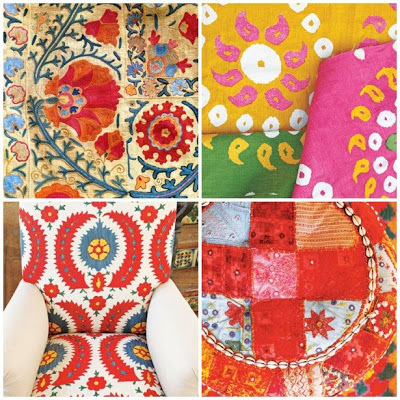 Let me say it again… I am mesmerized by this eclectic colorful dream that Kathryn calls home! What I also noticed about this home is the incredible collection of textiles/furnishing inspired by Asian and Arab/Moroccan culture. Which should not be surprising since apart from being an interior designer, Kathryn also runs a successful fabric and furniture line. 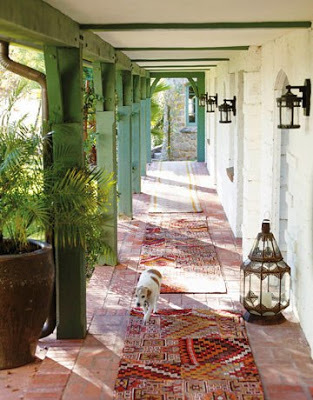 And the outdoor are as gorgeous as the indoors! 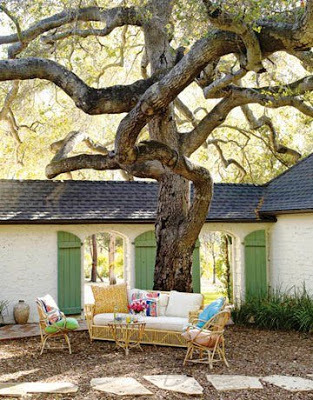 This outdoor sitting is one of my favorites! 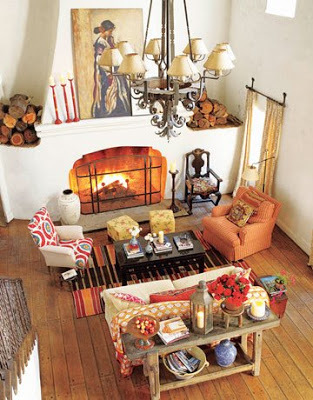 Sample of color accents used in the house..
Sigh…I love this house too. Just enough color to make it happy, but not too much. Wonderful! How fun to see KI’s home here. 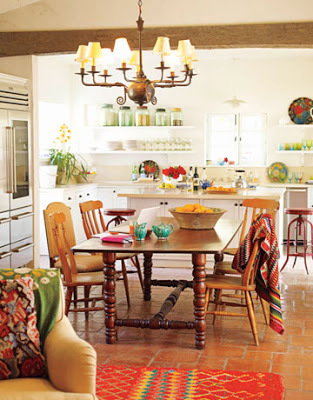 I bought that issue of House Beautiful simply because of that interior! I love suzanis and her use of color and texture is wonderful, isn’t it? 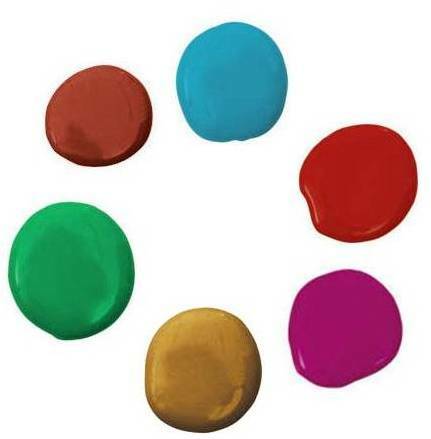 Just love all the colors, great post so glad you shared it with us!! She is selling the house…I saw it on a real estate website for the area….how can she leave? I would have to be carried out! what a beautiful house. i looove the tiles on the staircase. the tree is sooo beautiful too. has so much character of its own. 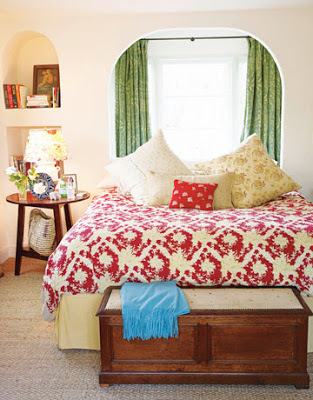 the beds look so temting… if mine were this pretty i would just stand staring at it lest i mess it up. Really enjoyed reading this post, Bhavana. oh my goodness! so inspiring and beautiful! Muito bem decorado, sim senhor. Thanks for sharing this post on this beautiful home. I have been to Ojai and it is a magical, special place. It is a real artist’s community. I just clicked your link for fun, cause the last time I wanted to check your blog I was informed that I have to be part of your club/team to read it. I was like oh well…. for the past 15 off days some personal projects have kept me so busy- I’ve not even been able to think about my blog- let alone do anything about it. But its great to see u are back with a BANG! Big hug! what a happy house. love the colours. Love, love, love this house! 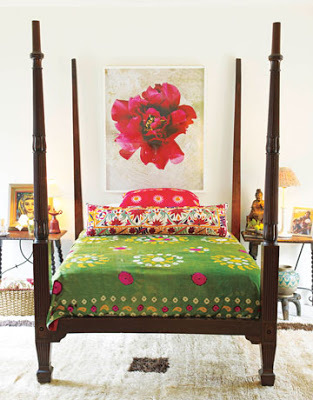 I am so glad to find others who are absolutely wild about it, too.I like her mix of ethnic things and color! I have to correct one thing in the HB article. They said the sugar and creamer on the kitchen table are Bauer pottery. They are, in fact, Mexican pottery called dripware and it is made in Oaxaca, Mexico. 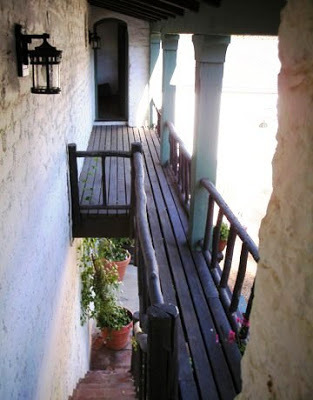 See http://www.hillcountryhouse.blogspot.com for more info. Of course, I love it that she has some of “my”pottery in her house! Great blog – adding you to my favorites! oh check out that amazing tree!! Awesome photos, beautiful house. 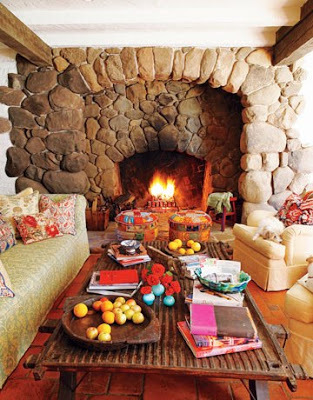 such a beautiful and colorful home, i love it! thanks for sharing. Oh wow! It’s so pretty, and I love all the pops of color against such simple white walls. Perfect! I love the bed with the posts and the lovely flower artwork. 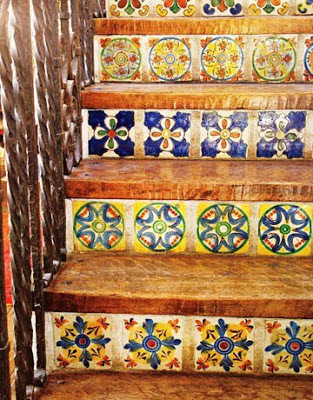 I also love the beautiful tiles on the steps. The colors are rich and beautiful!